Chelsea star Eden Hazard was hugely influential in his side’s win over Watford on Wednesday night, and he delivered a reassuring message to fans after. The 27-year-old bagged a brace to help seal a 2-1 win at Vicarage Road, taking his tally to 10 goals along with nine assists in 21 appearances so far this season. However, he achieved an even bigger landmark with his first goal, as it took him up to 100 goals scored for the Blues, writing his name into club folklore in the process. While the win was crucial in terms of Chelsea’s hopes of securing a top-four finish this season, Hazard also gave reason for fans to cheer after the game as they will surely have loved what he had to say about his intentions moving forward. Given that he continues to be linked with a move to Real Madrid, as noted by the Metro, the fact that the Belgian international has said himself that he wants to remain at Stamford Bridge to become a club legend will undoubtedly be met with relief and joy by Chelsea fans. 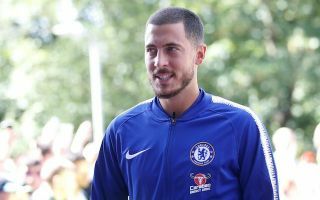 Time will tell if that actually materialises and he snubs a move to the Bernabeu if a bid is made, but based on his comments above, it sounds as though Hazard is committed to Chelsea and is delighted to be putting his name in the history books. As he continues to play a crucial role for Maurizio Sarri and with Chelsea building under the Italian tactician to potentially compete for major honours again sooner rather than later, it could be enough to convince Hazard to stick around for the long term.